Over the past five years we have become friends with Chris and June Goldsmith. Chris would often come to farm events with a keg of his latest homebrew in hand. It got to a point that other members relied on Chris to bring a tasty brew, he gathered a considerable following. Not one to discourage community building I offered to grow Chris some malting Barley. We planted 8 acres of a variety called Metcalf in the fall of 2008. Since the harvest in June of last year we have been figuring out what to do with 16 tons of the crop. Chris investigated custom brewing but it all came down to the sad fact that there is not a malting house in California. The nearest of any size is in Reno Nevada or Oregon. Then Chris made the connection with Ron Silberstein at Thirsy Bear in San Francisco. Ron runs an organic brew pub and has worked with such local farms as Full Belly buying relatively small quantities of wheat to help in the brew process. Thirsty Bear requires 1100 lbs of malted barley for each batch of beer so Chris had to find a malting house that would return his phone calls and brew such a small amount. Eventually he was able to make contact with Colorado Malting. They custom malt small batches so we had a one ton bag trucked to them. 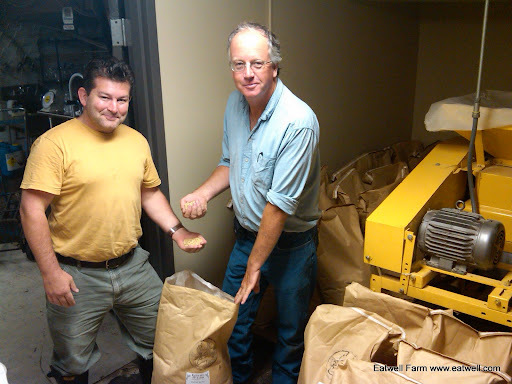 Last week 1200 lbs of bagged, malted barley arrived back on the farm. It was delivered to Thirsty bear on Monday afternoon and Tuesday morning the brewing began. Brenden Dobel, the brewmaster declared that the malt was perfect that he will be making a beer that will be a strong golden ale featuring hops from Hops-Meister Farm near Clear Lake. It will debut/launch on Tuesday 24th August at Thirsty Bear. You are all invited to the event which will also feature an Eatwell Farm Heirloom Tomato tasting. What could be more pleasant than great beer and food. We look forward to seeing you there.